Canyon Lake has everything going for it as a recreational lake and beautiful natural feature. It has gorgeous, crystal, Caribbean blue water and an idyllic location amid the Texas Hill Country. 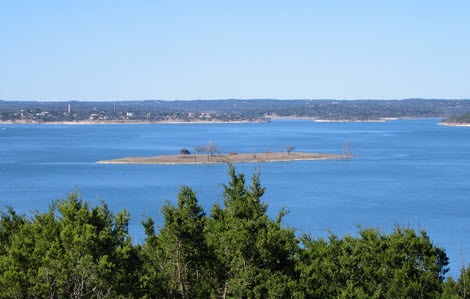 Canyon Lake is between San Antonio and Austin and provides a quiet respite from the hustle and bustle of the city. Canyon Lake homes for sale are an excellent investment for those who desire a scenic place to live. You’ll will find no shortage of beautiful Canyon Lake homes for sale, from modest to large, from cozy bungalows to expansive, lake view estates. There is a variety of styles, floor plans and curb appeal, together with a tranquil, yet engaging environment in Canyon Lake real estate. Canyon Lake real estate offers incomparable options in vacation, second home, permanent or retirement real estate. It offers stunning options in custom homes, custom home sites and acreage. There are several neighborhood that make up The Canyon Lake. These include Canyon City, Sattler, Cranes Mill, Startzville, and Hancock. There are three zip codes for the city, which are 78130, 78132 and 78133. Homes for sale in Canyon Lake TX range in price from about $53,500 up to $3,950,000. Home sizes range from about 896 square feet up to 11,368 square feet. Water amenities are plentiful around and on Canyon Lake. The best locations for water fun include the Canyon Lake Damn for walking or jogging, The Guadalupe River for tubing, Canyon Lake Gorge for hiking, as well as Lake Canyon Yacht Club, Canyon Lake Golf Club, and the Heritage Museum & Dinosaur Tracks. Canyon Lake real estate is also highly desirable because of the plethora of community events and social gathering for residents to get involved with. It is a place full of community spirit. In December, for example, residents can enjoy the Canyon Lake Boat Parade and the Christmas Parade. Comal Independent School District is zone for Canyon Lake real estate. The schools in the area are Smithson Elementary, Startzville Elementary and Canyon Lake High School. Canyon Lake TX homes for sale are ideal for growing families both small and large. Don’t hesitate, if you love the outdoors and water sports, Canyon Lake TX real estate is the perfect choice. For open house or more information, please contact the Texas experts at McNabb & Co.
Find Canyon Lake Real Estate, Including Homes for Sale and Lifestyle Info. Now THIS is Texas Hill Country! 55 gated, fenced, unrestricted acres with truly jaw-dropping views of Devil's Backbone. Asphalt drive, RV hookup, 3-car garage, pool/hot tub, 3401 sq ft custom home, 3000+ sq ft deck. Cedars have been removed from the front half of the property leaving oaks and other natives...you'll see birds, turkey, deer, rabbit, roadrunner, seasonal springs, waterfalls, and more on this property. The 4 bed 3.5 bath home is centered on the property with lots of windows for views from practically every room. Be sure to watch the virtual drone tour. You'll have to see this property to fully appreciate it! Beautiful Canyon Lake waterfront custom home in the gated community of Kings Cove on the south side of the lake. Featuring 3 bedrooms, 2.5 bathrooms and 4,653 sq. ft. with spectacular views from the first and second floors. Extensive open floor plan with 22 ft ceilings, beautiful kitchen that opens to the living room with a rock fireplace and expansive windows to take in the light and views. All bedrooms downstairs with a huge gameroom, wet bar and theater room upstairs. Large master suite with beautifull lake views, separate vanities and whirlpool tub. Outside features a 3 car garage with work area, 1 carport and extended driveway. The outdoor patio is built for entertaining at the lake and with 212 ft. of water frontage you are sure to enjoy your water time. Please view the 3D tour of the property! Gorgeous views of Canyon Lake and Hill Country home located on almost 3 acres with private gated entrance. This 5 bedroom, 3 bath has 2 living areas, each with fireplace. Master bath has large sauna. Enjoy the 32' decks with water views while entertaining. Sit and listen to the peaceful water flowing in the stocked pond. Separate entrance to downstairs living are is great for out of town guest. Area for gym or theater room under the garage. Great full time home or weekend retreat! SELLERS will entertain all reasonable offers!! Immaculate, Tuscan-inspired home on a vintage oak-covered level lot! “Custom everything” with 3 bedrooms, 3 baths, study, game room, and a media/flex room. Stone walls, lots of windows, iron chandeliers, gorgeous stained concrete floors, and handmade barn doors make this a show stopper! For the cook, there’s a gourmet kitchen featuring a Wolf gas cooktop, Bosch convection ovens, “Sonic” icemaker, oversized pantry with antique door and faux finished custom cabinetry. Outside you will find a stained patio with WBFP, and beautiful landscaping! An oversized 3 car garage with epoxy floor completes the home. You will fall in love with the great floor plan, neutral color scheme, and the many special features and upgrades throughout. Don’t miss this Mediterranean-inspired, one of a kind, well-maintained beauty! This home has to be seen to be believed! Amazing views, gourmet kitchen, gym/craft/bonus room, 1100 sq ft detached Casita (65% complete), full on in-law suite with own kitchen, living room, bedroom and bath on main floor; constructed to withstand just about any natural disaster - check out the construction details attached. Main floor has Master bedroom suite, office, living room, kitchen, dining room, guest bedroom with adjoining bathroom, gallery, full length covered balcony and in-law suite. Lower level has bedroom with en-suite bathroom, outside access, laundry room, media room with full wet bar, garage access and opens to lower covered patio to the pool and hot tub. Lower level gym/bonus room with private access to master suite in addition to pool and media room access. Also there is an elevator ready shaft to the main level large enough for a wheel chair and caregiver and lower level access to unfinished space for a wine cellar and/or safe room. Soaring ceilings thru-out! Historic Haufler Homestead on the land grant from Sam Houston in 1860. Fachwerk, log, and solid rock rooms join a gourmet kitchen addition to the main house. Home overlooks a large stock tank, windmill, and newly built guest house (600 sq. ft.) and large oak trees and rolling meadows. Extensive high-quality upgrades. The property has 3 wells, a hothouse, a dog run, two repurposed grain bins, and covered sheds. The shop (1500 sq.ft) includes a 6000 lb. vehicle lift, a shower, sink, and a workshop/craft room. The main home is fenced and the property boundary is fenced. Great property for horses. (No hogs allowed) You must see to appreciate all of the special features of the property. Property is under Wildlife Management valuation. Come sit a spell on the front porch, or the patio with the historic cistern, or the covered porches on the side of the house. This is a peaceful little slice of Texas history just waiting for your love and enjoyment.